Join us at City, University of London. You can apply through Clearing each summer to study undergraduate courses with us starting in September. Clearing is a process where, if your grades aren't what you were hoping for, you can contact us to apply for any remaining places on our undergraduate courses. Also, if your results are better than you expected, you may be in a position to consider studying at City by applying through the Adjustment process. Applications for 2018 entry through Clearing and Adjustment have now closed across all courses. Information for 2019 entry will be published here in due course; the process takes place each summer, with some availability for students with international qualifications in July and for UK students following the release of A-level results in August. Don't miss out on your chance to study at City, where you'll find a buzzing campus in the heart of London and academics who are not only at the top of their fields, but also have excellent links with business and the professions. Everything we do is geared to help you hit the ground running when you graduate. Clearing is a time when getting the right information is important. We have everything you need to get prepared. Read more about the City experience and hear what our students say makes us a great place to study. Clearing is an important choice about your next few years. We can help to guide you through it. If your results are better than you expected, you may be able to apply to City through Adjustment. Browse our wide variety of undergraduate degree courses and see which options may interest you. 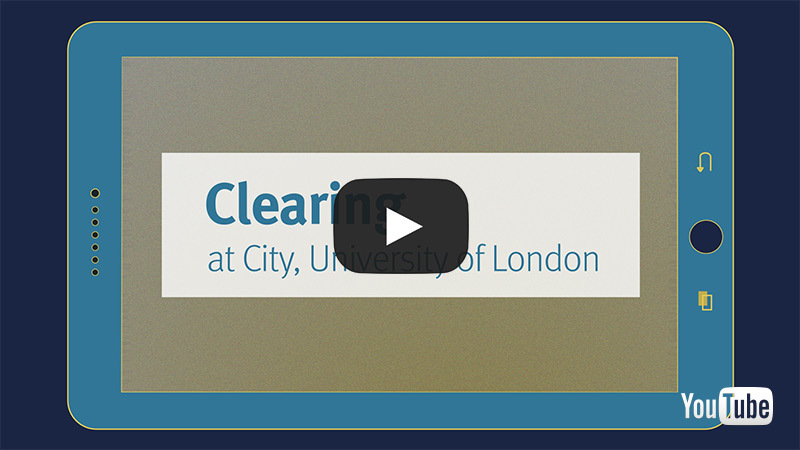 Find out more about how the Clearing process works, and how you can join us this September.